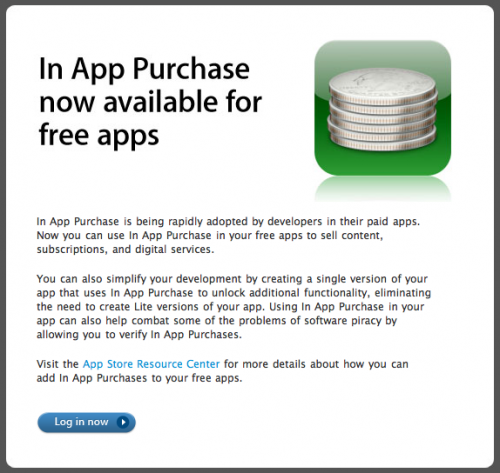 Visit the App Store Resource Center for more details about how you can add In App Purchases to your free apps. Hmm, I don’t like this idea a whole lot. I have a feeling that we will start to see apps that say they are free but you download it, and then it tells you you have to pay. I like free apps that are truly free. i totally agree, in this instance they need to have a new category, EG Trial / Demo or something like that. I agree with the above comments, although this type of system will help cut down on apps that require a $.99 initial purchase such as many of the navigation apps. With that having been said, it still stinks of cronism. The App Store since its creation has become saturated with junk. Apple and their developers should focus less on payment and more on content. The bottom line is that no apps will be free. This may take a little time but will happen sooner or later. Thus Apple is once again lining its pockets and ensuring that they rake in money from ALL apps.